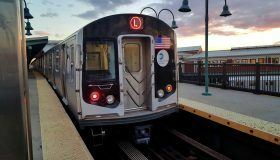 6sqft previously reported on the city’s plans to provide alternatives to the L train during the 2019 shutdown for repairs in the Canarsie Tunnel under the East River and the reaction of community groups affected by the planned changes. A coalition of West Side neighborhood groups fearing disruptions from buses, bike lanes and other changes sued the agencies tasked with implementing the L train alternatives. Now the New York Daily News reports that according to court documents, 14th street will become a “busway” for 17 hours each day–among other strategies–to limit car traffic during the shutdown.